Just catching up with this thread...some really nice pics everyone. Thats always been a nice one of Dusty. I love the outfit. Nice one Cor, yes Cas she looks cool. Yes! What an awesome outfit in that pic!...and I love her eyes in this pic! Joshy..... take a queue number, okay. Looks good that one Liz, think it would make a great desktop background pic. Thats a nice one I can't recall seeing Clive, thank you. dont they all look happy to be on the show together. I think Matt Monro was such a great singer too. You are both very welcome, I hadn't seen this exact one before either. Simon's comment to this photo: "It was taken at the launch party for It Begins Again at Les Ambassadeurs in Park Lane, London, in 1978 and is the first time Dusty & I were photographed together." Nice pic. Cor, and like to see her like this. Wonder if Simon still has the badge? Yes thats a lovely photo Cor, thank you. looking through the eyes of love??? A picture we have on page 3, but bigger this time. Bigger is nicer Samuel, thank you. Thank you Clive, I've copied it for all to see. You are SO good at finding these new ones, thank you. thanks Cas, it woudn't copy for me. Nor for me but my son showed me how to get around that, and I think I have the hang of it now! 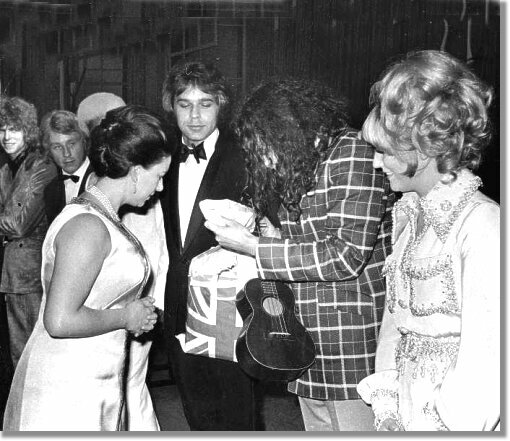 Brilliant Clive, another great find, you deserve a gold star I take it they were at the Dutch Edison Awards and I think I spot John Adams in the background. Always lovely to see all these pictures...especially ones not seen before. It's not actually a jacket Liz but a long fitted coat......so it can't be that Have you noticed how the guy in the fur looks totally mesmerised by her, even though she's not the one speaking? I love her outfit ! Thank you so much, Clive. Great to see this from 1968 , are there any more Clive ? thanks. 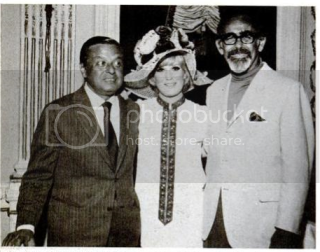 A new picture (for me anyway) I found on Ebay of Dusty with Rod Stewart and Olivia Newton John. I saw it too Samuel, its slightly different isn't it? karen wrote: Great to see this from 1968 , are there any more Clive ? thanks. I'm afraid I couldn't find any other new ones Karen. Not sure if you've seen these though.I think they were from the same visit. I think Frans posted them originally on the old forum. Heres one I saw in my files. thanks Cas, never saw this before. I always like these ones of Dusty with people she worked with. No not new but can't recall it being on here Clive. I found this one this afternoon whilst looking in my files. So who is this with the Springfields, I know, do you? Thanks Carole I dout anyone else knew! I recognise the name but didn't know what they looked like! I could never have guessed that. Heres another one for this thread with Alf of course. Lovely picture, and lovely dress. There is a new book out on Elton called The illustrated Biography by Jane Benn, it features a black and white variation of the photo above. The caption in the book says it is Elton with Bette Midler! Thanks for the information, Clive. Thank you Clive could be worth a look! Looks like its cropped from this photo Clive. Nice in blue! I recognize this photo from Carole Pope's book "Anti Diva! This is "backstage" 1986 during Rough Trades "farewell Concert" in Canada. Dusty made a guest appearance. Nona Hendryx was on stage too doing backup singing. Also this one- we all know the story of what happened that evening-this is a slightly different picture of what i have seen before- but doesnt the 'chauffer' look familiar? The picture with Johnny Burnett is somewhere else on the forum Dave and the other lady is Maureen Evans. The guy with Dusty and the bike is Alan Dunn, I think he was her road manager at the time. I think Dusty looks so cute on that tandem bike! You gotta love her sense of humour! Thank you for the pic of Dusty on the tandem Dave, I have a few different shots of that one, but not seen this one. Thanks again. I think thats a really happy photo Karen, Dusty looks as though shes having fun! We have a similar one of this on the first page as I checked,but I love this bigger version. With the very dishy Scott Walker. I don't think that's Dusty. 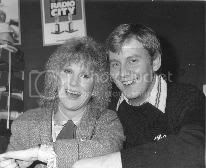 we have pics on here of Dusty with crckery in a market when she toured there so maybe thats the teaset,anyway its a miracle it survived the crockery throwing sessions, sorry I digress, so back to the pics and onwards and upwards. No I had no idea, thank you for all suggestions, I nearly had a fit Helen when you said you didn't think it was Dusty! I'd to double check! Sorry I was on my phone when I looked at this. Any info on this one I came across please? I have seen this somewhere before but haven't a clue where! It sort of looks like they're on a boat, but it's Dave Clark next to Dusty and Lee Everett and her husband. Thank you Carole, I thought it looked like Dave, but I had no idea who the others were. Its not a clear photo. daydreamer wrote: I have seen this somewhere before but haven't a clue where! It sort of looks like they're on a boat, but it's Dave Clark next to Dusty and Lee Everett and her husband. Well spotted Maria, I'd never have remembered that! Scanned through all of these pages and the Nuns aren't on this thread! Bet those nuns were proud. Looking through my files and saw this one. Sorryabout the writing and the condition. Cas19 wrote: Scanned through all of these pages and the Nuns aren't on this thread! This is a fantastic photo, Cas! I love it! An old cutting of Dusty and Peppi. Another small pic of Dusty with the lovely Peppi. Cas19 wrote: Another small pic of Dusty with the lovely Peppi. Aww how adorable is Dusty on this one?! Thats a new one to me Clive, thank you. oh thanks Clive and nice to see Billy J.
found this while browsing a kathy kirby website, not sure if its been on here before. I haven't seen it before Anita. Thank you. Nor the Pat Boone one Cas. Can't say I've seen that one before either Anita, its a great pic, thank you. Original caption: Pictured at the London Palladium last night are blonde songstress Dusty Springfield with Dave Clark Five. In the front row, L-R, is Dennis Payton, Dave Clark and Len Davidson. L-R behind Clark are Rick Huxley, and Mike Smith. In the background are some members of the Tottenham Hotspur Soccer Team.